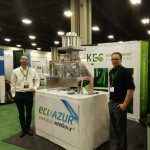 Once again our Kitchen Energy Solutions team was pleased to participate in the annual World Energy Engineering Congress (WEEC)! This year’s conference was held in Charlotte, NC on October 17-19th! We partnered with Intellinox Technologies providing personal demonstrations featuring the benefits of ecoAZUR demand control kitchen ventilation technology! Interested to learn about ecoAZUR, contact Cameron Ritzenthaler at (603) 262-9292 x704 or email him at cameron@KitchenEnergySolutions.com.